Justin Locke is an Author, Speaker, and Publisher. Here on the JLP website you can purchase his book, Real Men Don't Rehearse; you can read the scripts of Peter VS the Wolf and The Phantom of the Orchestra, his internationally acclaimed family concerts for orchestra; and you can see his speaking topics and appearances. -- For more info, questions, etc. : send him an email at justinlocke@juno.com or call 781 330-8143. 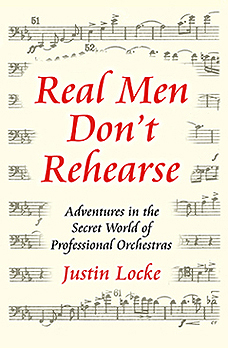 Reviews and Reader Comments: What people are saying about “Real Men Don’t Rehearse” . . . . If your idea of a great ab workout is laughing until your stomach hurts, this book may save you hundreds of dollars in gym membership fees. Real Men Don't Rehearse (Adventures in the Secret World of Professional Orchestras) is a breezy do-tell-us-all, with some of the names changed to protect the innocent. Justin Locke, who spent 18 seasons as a freelance bassist with the Boston Pops and, according to his resume, just about every other orchestra in New England, is a veritable Scheherazade. He captures on paper all the fun that musicians have when they get together after hours. That's when the storytelling starts, and each anecdote is more outrageous than the last. You'll read how the bass section of the Boston Pops staged buffets backstage under primitive conditions during intermissions for the orchestra's famous July 4th outdoors concerts. (Marinated swordfish wrapped in foil and heated up with a butane torch...mmmm!) He regales readers with a description of his summer as a scholarship student at Interlochen, confirming once and for all everything that Larry Hurst has said about blue corduroy shorts and morning calisthenics. It's true, all true! There is a chapter dedicated to the heroic and unsung music librarian, and the hilarious graffiti that inevitably accumulates on instrumental parts throughout the decades. The affectionate recollection of the great Henry Mancini and the joke 90 orchestra members played on him, live on stage, will bring a smile to your face. You'll learn new musical terminology, like "hackoso," which is the opposite of virtuoso. And a number of Boston Pops musicians are still wondering whether the tiny restaurant they walked into while on a tour in Japan was really an accidental home invasion. Reprinted with permission, International Society of Bassists, www.ISBworldoffice.com. "Just too funny!" -- Music & Vision online Classical Music Magazine (See the entire review HERE). "I brought with me on a trip to DC. My plane was delayed 45 minutes. Jet blue turned it into a full scale crisis & we (a sold out & very big plane) all thought we were stranded at Logan. they had pilots standing on chairs in the terminal explaining how air traffic works & general announcement about not knowing when we would board or why we were delayed over intercoms. chaos over 45 minutes during a thunderstorm. I fed right into it. Eventually we boarded and it was a solemly QUIET plane. I was quietly in the back reading your book. I suddenly burst out laughing. People shifted in seats. By the 3rd or 4th time I laughed out loud, people were looking at me like I was laughing in a Catholic funeral mass. To say the least, Real Men Don't Rehearse is a great time. I loved it." "This is not a book to read in the quietude of a library as you're apt to break out into uproarious laughter! Justin Locke is a consummate story teller with the engaging ability to make us feel a part of his life's experiences in music. You don't have to be a musician to fully grasp the hilarious situations into which he places you." Well, I got your book yesterday afternoon and it was finished by bedtime. It was GREAT! I couldn't put it down as I related to so many of the experiences you wrote about. I was in tears reading about your charter plane emergency procedures. "BUCK-LE, BUCK-LE......OOOOOOOH" HAHAHAHAHA Now, I have never had the pleasure of touring w/a group; the closest I have come to "touring" so far is a high school band trip to D.C., and your airplane ride sounded like what the clowns in band would pull. They never grow up, do they? Thanks for a great book. It was a nice way to unwind last night and not think about the . . . "Pops" concert I have to do next week. --S.F. I bought your book "Real Men Don't Rehearse" for my brother's upcoming birthday. He graduated NEC two years ago and is trying to break into the world of a classical composer. Anyways, I love classical music and couldn't keep myself from peeking at the book. Two hours later I am twenty pages from the end and I don't want it to end! Well, I'm blabbering away and never send e-mails like this but I just had to tell you how much I love the book and can't wait for my brother to read it! I am a music teacher in Milford MA where I am in my 35th and final year. I teach all of the strings and brass from grades 3 12 and conduct six orchestras. I also play professionally (primarily ceremonial trumpet). I graduated from The Boston Conservatory in 1971 and studied with Gerard Goguen while attending college. I loved your book. It was like reliving stories that Mr. Goguen would tell me about life in the BSO. Thanks so much for a lot of enjoyment. Just want to thank you for sending your book and for adding such a nice birthday greeting for my friend. I just finished it and so enjoyed it! Am sure I've seen one of your bass spinnings at a Pops concert, and could especially relate to your experiences at Interlochen. I was not a nymphet harpist (just one of the dime a dozen pianists) but did smile lots remembering the "challenges" (I took a beginning string class to try to learn the violin but never became good enough to successfully challenge my way beyond last chair) and, of course, the corduroy knickers and knee socks we, even the nymphets, had to wear! Yes, let me add another "All right Jus tin" – I know my friend will really enjoy her birthday present! Thanks again. Thank you for taking the time to write and publish this wonderful book. How rare is it to laugh out loud when reading in this day in time? Our signed copy is on its way to Florida to delight an aunt and uncle who love nothing more than a good story with lots of humor so would you please accept the enclosed for another copy! Thank you and the very best for you now and to come in all that you do. I just want to tell you how much I enjoyed your book. It was very funny. I a member of a hand opera, we have has some amusing experience is also I have thoroughly enjoyed reading "Real Men Don't Rehearse" and actually only finished the final chapter last night! Some of the anecdotes are just wonderful and I've had so many laughs. Just a little note (long overdue) to tell you that I LOVED your book. I read it with smiles and with chuckles. It brought a whole new dimension to watching the Boston Pops on the 4th...I kept looking for the "Locke" brigade...just to see if I could find them. You brought the orchestra alive in a way that they never imagined and I enjoyed every word. I probably got a little more out of the book than some because I used to sing and all through the early years of my life, I participated in choirs, chorales and the like. I could identify with the "group musician" comradery, especially the way you captured it. What a wonderful way to make a living! I have since passed the book on to a friend and when she is done reading it, she will pass it along to another lucky reader. Thanks again for writing such a delightful book. A new fan, Joan O. Good and fun books are a real treat. Yours is in that category! -- Barbara K.